Who makes Tulsa awesome? That’s the goal of the Boomtown Awards, one of the many events hosted by Tulsa’s Young Professionals, one of the largest and leading YP groups in the nation. TYPros gives its members, professionals aged 21-40 from all professions, chances to build relationships with local community, business and government leaders. Here are the winners. 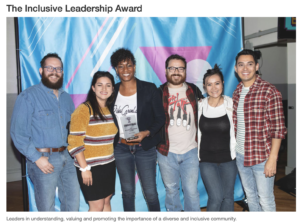 Leaders in understanding, valuing and promoting the importance of a diverse and inclusive community = The Inclusive Leadership Award. Risha Grant is the Founder & CEO of Risha Grant LLC, an award-winning diversity consulting and communications firm. Their mission is to utilize diversity communication strategies, tactics and training as a catalyst to create an inclusive culture in every company and community. Her passion, knowledge, and humor contribute to the engaging approach of her consulting and training, which has helped governors, NBA teams, mayors, Fortune 500 companies, non-profit organizations and companies to reduce bias and further the understanding of Diversity & Inclusion.